When someone asks me what I am up to, I reply ‘I’m writing a novel, the third in the trilogy.’ If they are not part of my inner circle, the reply would usually be ‘Oh that’s exciting! When will it be published?’ It’s the dreaded question I hate to hear because I’m 13 months behind. 2016 ah… 2016… it snuck in as meek as any other year and ended on a disappointing flat note. Not just for me but for a lot of people just getting through this whirlwind craziness of the year. I can count how many times I was asked ‘Did you finish writing your book?’ and let’s just say it is in the double digits. It’s the day-to-day things that have eaten away at my time and my energy. But that answer isn’t ‘exciting’ enough. In between the mundane moments of the day, I ponder on the story. It eats at me, reminding me during every waking moment that the story needs to get out of my head and onto the pages. So sneakily I write very late at night for twenty minutes when I can before I collapse into a restless sleep. Writing is a lonely place. It’s mentally exhausting yet exhilarating, all at the same time. Now on the first day of the new year, I have completed writing 73% of the final book of the Among Us Trilogy. On another note, I wrote two articles for Blasting News at the end of 2016. 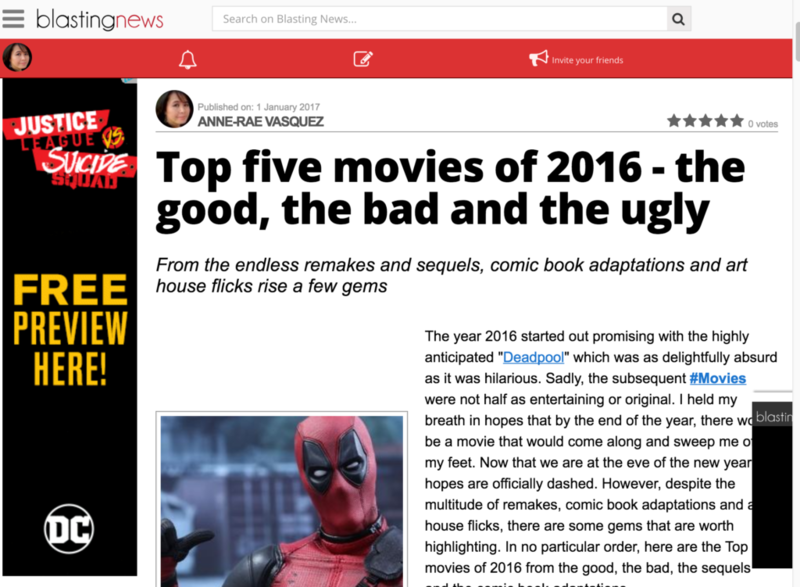 Check out my top 5 movies of 2016 (the good, the bad and the stinkers) by clicking here… Have a happy new year. Among Us Trilogy, anne-rae vasquez, author, author update, looking back on 2016, top 5 movies of 2016. Bookmark.